This event is running from Jan 1, 2018 until Dec 2, 2019. 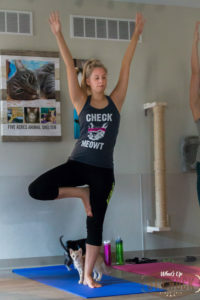 Sign up to participate in Cat Yoga at Five Acres Animal Shelter. 100% of proceeds benefits the amazing cats that will be joining you on your mat. There is a minimum $12 donation required at the door per participant and other monetary or in-kind donations are more than welcome. You must bring your own mat. Space is limited so please no additional guests unless they are registered. You must be at least 16 years old to participate or 13-15 years old with an adult.